As a provider of real estate solutions that support evolving businesses, it was a necessity to incorporate flexibility in both environment and service to be able to respond quickly to tenants ever changing needs. Adopting an attitude of constant evolution was critical. This mindset was nourished throughout the project with frequent user feedback sessions and workshops to ideate the path to the future and how to approach the new site. Because many elements had already been tried and tested on existing sites, the design approach varied from a traditional methodology; the typical design phases were replaced with a process of testing and analysis of ideas to build on the existing model. The approach to each site takes a long-term view within the parameters of a short delivery programme, recognising innovation takes time, prioritisation is required; for each new site the project team identifies areas to address that will provide the most impact to support tenants. In the instance of 2 Southbank, the most relevant topics developed to evolve the existing delivery model were: Workplace as a service; developing a truly hosted experience that recognises the needs of an increasingly diverse range of members. The power of teams; creating larger team rooms with more flexibility that cater for project teams from larger organisations as well as the security and technology requirements of larger parent companies. Enhance the overall building ecosystem; become the important glue to the overall building ecosystem, a conduit between both the building owner and building users, and between the building users themselves. The inclusion of Space & Co. at 2 Southbank was also part of a broader masterplan for the building. With the need to release 23,000m², the building undertook a significant refurbishment to reposition the asset. Space & Co. play an important role in this building ecosystem, their model of commercial workspace services with a hospitality focus supports not only the tenants that reside on Level 19 but residents of the entire building and surrounding precinct. To achieve this, additional to a mix of enclosed, semi-enclosed and open workspaces dedicated to Space & Co. members there is a range of amenity available for all building tenants including a café, bookable meeting rooms, a large workshop, and conference space. 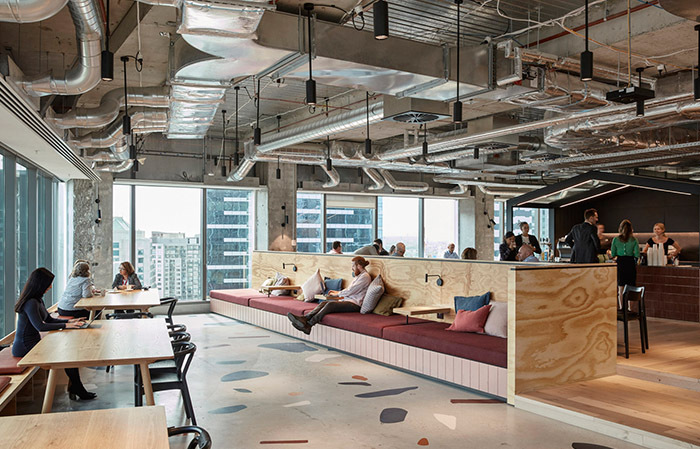 These spaces have been hugely popular with all building tenants and are perceived as an extension to their own workplace; it has been a weighty drawcard for prospective tenants. All of this contributes to the hosted ethos of the overall building. Over the course of the Space & Co. projects the team has made great strides in responding to a world that is rapidly changing. It is an appreciation and attitude that creating a responsive next generation work environment is not a one-shot deal, it is instead through the completion of a series of projects with ongoing user interaction that we are succeeding in evolving the model to meet members everchanging requirements.